The North Carolina Notary Law Primer<br /> All the hard-to-find information every North Carolina Notary Public needs to know. <br /> Here is a comprehensive text that explains Notary laws and procedures in easy-to-understand terms and provides recommendations and tips for worry-free notarizations. <br /> Covering laws specific to North Carolina was well as general Notary practices, The North Carolina Notary Law Primer is an essential everyday reference for Notaries, those planning to become Notaries and those who work with notarized documents. <br /> This complete resource provides the following: * Instructions for becoming a Notary Public and renewing a Notary commission. * Official seal and bond requirements. * Proper ways to positively identify signers. * Legal certificate wording for all notary acts. * Words for oaths and affirmations. * Procedures for keeping a journal of notarial acts. * Instructions for authenticating the signature and seal of a Notary. * An explanation of Notary misconduct and the penalties that may result. * The complete text of North Carolina Notary laws. * Addresses and phone numbers for the Secretary of State s office and Bureaus of Vital Statistics for all U.S. states and jurisdictions. * A complete list of nations subscribing to the Hague Convention, which simplifies the authentication process for documents sent outside the United States. 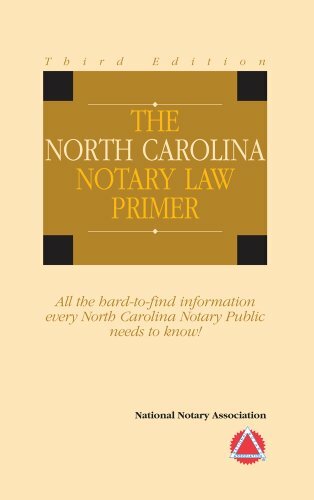 <br /> The North Carolina Notary Law Primer is a must for all North Carolina Notaries who want to perform their official duties confidently and according to law.